Lyme rage, irritability, personality changes, emotional instability, seizures, tremors, hypothermia, migraines, headaches, not to mention cognitive dysfunction in the form of brain fog, brain fatigue, memory loss, dyslexia, systemic dystonia, and attention deficit, and many more symptoms are maladies often experienced by people with neurological Lyme disease. There are definite, and scientifically recognized causes of these problems. This article will discuss the pathophysiology of Borrelia-induced encephalopathy. The multiple strains of Borrelia spirochetes (spiral-shaped bacteria), most associated with Lyme disease, are closely related to the spirochete of Syphilis, another malady that was known in the medical community to cause predictable neurological problems. One might say that Lyme spirochetes are the genetically-enhanced cousin of syphilis. Both are able to shape-shift in order to escape antibiotic treatment efforts. They are called pleomorphic bacteria (Lida Mattman, PhD). Research has been reported that within 20 minutes of infection from the bite of an infected insect the Lyme spirochetes can reach the brain. When this happens, very predictable problems begin to occur. The spirochetes of Syphilis and LD are known produce urease enzymes which cause localized ammonia to accumulate (hyperammonemia) in the brain. The Lyme-induced ammonia causes inflammation and swelling of the astrocytes (brain cells) leading to numerous subsequent neurological symptoms. The presence of the spirochetes and ammonia in the brain also cause the blood-brain-barrier to leak, allowing larger molecules to enter the protected inner sanctum of the brain. The brain essentially registers these substances, the increased swelling of the brain cells, and the excessive alkalinity of the ammonia, as a brain trauma. 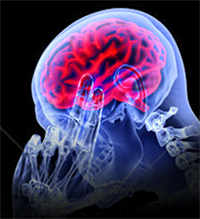 On MRI of the brain, longstanding Lyme encephalopathy can present like a classic traumatic brain injury, from a car accident or other physical injury to the brain. The prefrontal cortex, frontal, and temporal lobes, which are largely responsible for working memory and executive functions are most susceptible to alterations in brain wave patterns caused by these bacteria-induced insults. Random, often unexplainable neurological symptoms often are the result of these irritants. All of life’s challenges can combine in “perfect storms” of issues, which can create spontaneous, idiopathic worsening of neurological symptoms. Challenges such as how much protein a person has eaten that day, a shift in the barometric pressure as weather fronts change, excessive salt intake causing increase fluid retention leading to increased brain edema in localized areas of the brain, poor dietary choices, hormonal shifts, emotional upsets, mental strain, physical strain, not to mention the harmful effects of medical or natural treatments that are not working in synergy with the body. The list is endless of possible life challenges that can aggravate the already hypersensitive and irritated brain tissues. When it comes to treatment, the challenges are just as diverse. For the lucky few who have enough inherent integrity in their body the lowering of bacterial population might be enough to allow complete and lasting health, in spite of the fact that they will always have the bacteria as part of the background microbial population. For the chronically ill person who is suffering horrible neurological symptoms in spite of every treatment and everything they try, it is sad but true that simply killing bacteria will not result in restoring the quality of life you seek. Yes the bacterial population needs to be addressed…from a overall body integrity perspective. However, more fundamental to this is the need to shift what has happened to the brain waves that regulate every single system and cell in your body. The brain waves control and regulate every chemical and cellular interaction in the body. Getting the brain waves optimized, available at the Hansa Center, and soon at the Limitless Brain Center, in Wichita, KS, in combination with strategic elimination and correction of the causes of Lyme-induced trauma frequencies, is the only way to dramatically restore the body's ability to regulate itself correctly. The ultimate treatment goal must be to restore optimum structural integrity and function to the brain. All of the bottom-line causes of neurological issues need to be addressed sequentially. · The source of the ammonia, the bacteria need to be brought under the control of the body. · The urease enzymes that are causing excessive ammonia to be produced need to be blocked. · The ammonia itself needs to be neutralized, so that it cannot continue to irritate the brain and cause swelling, and draining the brain’s energy production. · The blood-brain-barrier must be repaired so that it no longer allows particles to reach the brain that were never supposed to do so. · The harmful toxins from the environment and from various causes must be detoxified and source-eliminated to remove accessory irritants. · The brain tissues must be nutritionally supported and mitochondrial energy production restored. · The structural issues that are now there from illness must be addressed. · Address all of the Lyme-induced epigenetic miasms and the Lyme-activated SNP mutation issues. · Finally, the brain waves themselves which have been stuck in various ways need to be assessed and relaxed, so that normal regulation of the mind and body can be restored. The old adage, “A chain is only as good as it’s weakest link,” is the perfect analogy to healing the body from the ravages of Lyme disease. The bullet point list above is just the most basic issues that a doctor needs to address in a person with chronic Lyme disease. This cannot be taught in blog posts. When every conceivable system of the body has been corrupted by this dastardly illness, its ultimate healing cannot be placed in the hands of the one suffering. Thinking every potential problem can be detailed into a blog that says, "Take these supplements and you will be well," is like buying a book called "Brain Surgery for Dummies!" It would be similar to calling the Mayo Clinic and asking their doctors to just figure out what is uniquely wrong in this multi-system illness and have the doctor tell them what to do over the phone or in an email. I would estimate that nearly 100% of our patients spent many years and many thousands of dollars on medications and natural remedies in their attempt to get well. Lyme disease has been in pandemic proportions for years now, and everyone has a “online cure” or “the online protocol to end all protocols.” There are the lucky ones who follow this or that online, "DoctorGoogle" advise and get well. There are many more people who have seen 30-100+ doctors and healers of all types, chased every home remedy, bought various machines, and still suffer day in and day out. In my opinion, people (and doctors) often compound their problems by taking essentially random supplements and medicines with no concept of their global effect on the biochemistry of their body. Your ability to return to health often requires a doctor to be the detectives that we were trained to be, although the vast majority of doctors are more like cooks and chefs, just following a cookbook recipe that they use with minor variations for everyone with the label, "Lyme disease." This is why I consider the doctors of the Hansa Center for Optimum Health, the Wellness Physicians of the 21st Century! Our doctors are trained to dig deep, investigate, innovate, and use the maximum applied effort and technology to seek out and help the body restore it’s perfect condition once more. I recognize that this is self-promotion, however when you have something unique, especially when compared to the standard healthcare delivery in this country, it must be contrasted. The standard medical care to to place all your hopes and dreams of health on a collection of drugs. The doctor essentially says, "Here, take this and come back in three months. You then wait month after month, wondering why you feel so horrible, wondering if it is the right thing to keep doing, wondering if it is working and that is why you feel so badly, or if you are reacting to the drugs and that is why you feel so bad, waiting to see if your lab test results are better, which even if they are better then why don't you feel better? Contrast this to our doctors, who work on your body at least an hour every day of the week (M-F), dynamically seeking out and problem solving every issue that can be found. Healing crisis and progressive worsening is minimized by constantly adapting what they are doing each day to how the body is shifting in response to all of the treatments and therapies. Health is not the absence of bacteria. Health is the condition where the body’s systems can oversee and control every type of microbe that enters the body, preventing it from causing disease. True health care seeks to restore this control to the body, instead of depending on the sledgehammer effects of antibiotics, drugs, and I.V. drips. The point is not to get to the point where high-powered drugs are necessary, just to barely manage the symptoms. The point is to enable the body to heal quickly on its own, whereby lasting health prevails. Treat the bugs and more and stronger bugs will follow. Treat to restore the optimum human condition and health will follow.